The most common types of heterogeneous fluids which form hydrothermal deposits are comprised of a gas and a liquid phase, although fluids which carry a solid phase also occur. Oil bearing fluids with 2 immiscible liquid phases are common in oilfields, but are a special field of study and are not discussed here. Although less commonly recognized, multi-component heterogeneous fluids comprising water with an immiscible gas phase such as CH4, N2 or CO2 are important in hydrothermal systems. There are widely held misconceptions about the appearance of their fluid inclusion assemblages in thin sections as it is assumed that they have the same characteristics as single-component boiling heterogeneous fluid systems, which is not necessarily true. They are also difficult to identify in microthermometric studies, which has led to very few studies of them reported in the fluid inclusion literature. These immiscible gas type heterogeneous fluids are quite possibly very common, yet they are poorly understood and little documented. R. J. Bodnar, T. J. Reynolds and C. A. Kuehn provide a comprehensive review of fluid inclusion techniques for studying epithermal boiling fluid systems in chapter 5 of "Reviews in Economic Geology, Volume 2 (1985): Geology and Geochemistry of epithermal systems. 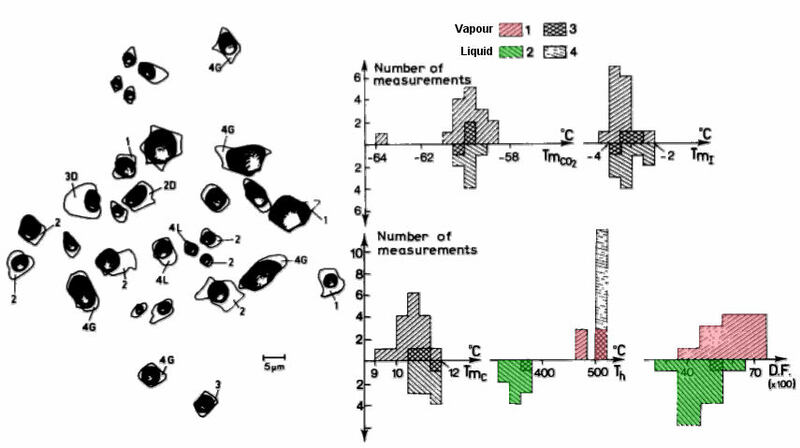 Published by the society of economic geologists" They explain that boiling systems should trap inclusions with variable liquid - vapour ratios, representing the end-member liquid and vapour phases as well as inclusions with random mixtures of these phases. Plots of the liquid-vapour phase ratios, or the observed homogenization temperatures should show a bimodal distribution. But that discussion applies specifically to single-component heterogeneous systems (boiling aqueous systems). Fluid immiscibility in natural processes: use and misuse of fluid inclusion data. By: Claire Ramboz, Michel Pichavant and Alain Weisbrod, Chemical Geology V37 (1982) pp29-48. An example of heterogeneous trapping in a quartz-cassiterite vein from Saint-Cierge, Massif Central, France. Distribution of the inclusions in hyaline quartz and related microthermometric results. Note that to see a bimodal distribution in homogenization temperature one must measure the homogenization of both liquid and vapour dominant inclusions, which is usually difficult to do. Some studies fail to measure the vapour rich inclusions and so fail to see a bimodal distribution. But a bimodal distribution can also be observed by measuring the degree of fill of the inclusions (DF). Note also that this data is from a single co-genetic assemblage of fluid inclusions. 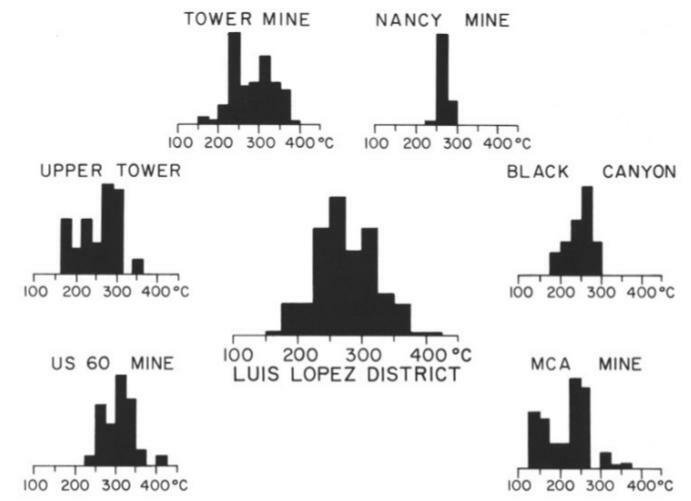 In contrast, this data from boiling fluids at the Luis Lopez epithermal manganese deposits, New Mexico fails to show bi-modal histograms on boiling fluids, probably because only liquid phase homogenization temperatures were collected. Homogenization temperatures for the individual deposits studied, and in the centre of the figure, the combined data for the Luis Lopez district. Since the hydrothermal fluids were boiling, no pressure correction is required and the homogenization temperatures should accurately indicate the temperatures of the mineralizing fluids. From: Mineralization of the Luis Lopez epithermal Manganese deposits in light of fluid inclusion and geologic studies. By: David I Norman, Khosrow Bazrafshan and Ted L Eggleston, New Mexico Geological Society guidebook, 34th field conference, Socorro region II, 1983. Immiscible gas heterogeneous systems differ from boiling systems. In boiling fluid systems, silica deposition and fluid inclusion trapping and sealing are very rapid, so inclusions represent the complete range of phase mixtures as they are sealed before phases can migrate and agglomerate. And both interference type inclusions and crystal defect type inclusions are abundant in this rapidly deposited quartz. As the epithermal fluid boils, changing much of the liquid to vapour, the volume of the liquid is drastically reduced and all the solutes in the parent fluid, including silica, are concentrated into this reduced liquid volume. The silica concentration exceeds saturation, but cannot become supersaturated because of the great turbulence in the boiling fluid and so silica is deposited rapidly at a rate to match the rate of boiling. Under these conditions of rapid deposition, the quartz is full of crystal defects, which become fluid inclusions when they are sealed over by continuing quartz growth. These "defect type" inclusions trap the parent fluid liquid phase, as well as mixtures of the liquid and gas phases. Gas filled inclusions are also trapped when a gas bubble attaches to a crystal growth surface and forces the quartz to deposit around it. These inclusions may well show a spherical shape due to the original shape of the bubble in the liquid and they trap only the gas phase with none or very little of the liquid phase that was of course also present. Overall these boiling systems are dominated by defect type inclusions which contain both liquid and gas phases from the parent fluid. Consequently the boiling fluid inclusion assemblage data could give bimodal data distributions. But there is no certainty that all boiling systems will show bimodal data distribution plots and the lack of such bimodal plots cannot prove the absence of boiling. However, immiscible gas fluid systems (multi-component), which did not boil, do not deposit silica so quickly and this can give a very different appearance to the fluid inclusion assemblages. This difference in the rate of silica deposition can lead to preferential trapping of one of the 2 phases present because the liquid rich inclusions occur as "defect type" inclusions and the gas rich inclusions occur as "interference type" inclusions and the mechanism of formation of these 2 types of inclusions are almost completely independent of one another. Slow silica deposition will give very few crystal defects and therefore no way to trap the dominant liquid phase as inclusions. But gas bubbles will be efficiently trapped by interference with the deposition of quartz, which is forced to deposit around the bubbles which then become pure gas filled inclusions. Consequently it is unlikely that plots of such immiscible gas fluid inclusion assemblage data would be bimodal, despite this being a true heterogeneous fluid system. It is quite possible that only fluid inclusions of the minor CO2 gas phase are trapped with no inclusions of the dominant aqueous phase. Although boiling epithermal aqueous fluids and immiscible gas bearing (CO2) aqueous fluids are both heterogeneous fluid systems, the inclusion assemblages trapped in these systems differ markedly because the inclusion assemblages trapped are greatly influenced by the rate of silica deposition as the inclusion cavities are sealed up. The rapid silica deposition in turbulent boiling systems may give inclusion assemblages that contain a full range of mixtures of the phases present in the original system. But the slow silica deposition typical of mesothermal quartz vein systems which contain enough CO2 and low enough temperatures for immiscibility to occur, will preferentially trap individual phases rather than both phases or a range of mixtures. One important case of this selective trapping gives assemblages of pure CO2 inclusions without any associated aqueous inclusions, even though water was the dominant phase in the parent fluid. This can easily lead to misguided interpretations of the nature of the source fluids, as seen in the incorrect assertion of a non-aqueous fluid as the source for the quartz vein and gold in Ghana. Interpretative methods based upon single component (H2O) heterogeneous fluid systems (boiling) cannot be used to understand the very different multi-component, immiscible gas (CO2 and H2O) heterogeneous systems (non-boiling). Doing so completely ignores the complex effects of immiscibility in the fluid. Spherical fluid inclusion shape can indicate heterogeneous trapping.